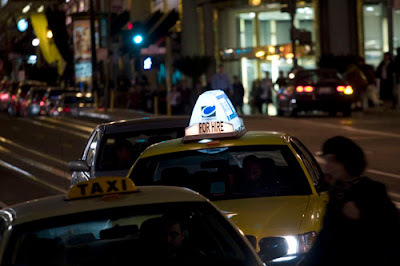 SF Taxi Media: North Beach Business Owners Want More Taxi Stands. By John Han. North Beach Business Owners Want More Taxi Stands. By John Han. San Francisco taxicab. File photo by John Han. According to the SF Examiner, North Beach business owners want more taxi stands in their neighborhood, in hopes that it would help boost their business clientele. Click Here to read the SF Examiner's article. How about that? Business owners wishing to help taxi drivers do their jobs easier, with the notion that doing so could help them do their jobs easier as well. What a concept! Thanks North Beach business owners! You get a coolness award! Thanks for thinking about us, so that we can think about you too. I haven't driven nights in a long time. But when I did, I remember the spot facing the Broadway tunnel (westbound) just near the corner of Broadway and Columbus, right in front of the Roaring 20's. That was always a good spot to stop and wait for a fare on Saturday nights. It was hardly ever a long wait. I got a Walnut Creek out of that spot once, and some other good rides along with regular in town fares. It seems that that would be one good place. Hey MTA, how 'bout that? There is a taxi stand at Columbus and Vallejo but the Police never enforce it and private cars are always parked there. Final Town Hall Meeting Schedule. From SFMTA.